Sparkling blue topaz sterling silver ring inlaid with bright blue-green Australian crystal opal. The round blue topaz is 7mm wide and weights 1.6 carats. 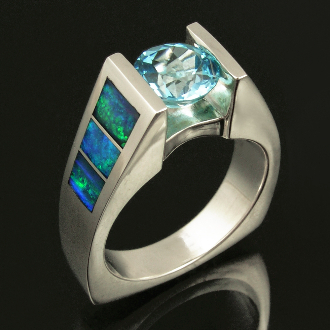 The inlaid blue-green firing Australian opal is a nice accent to the blue topaz. The photos can't really capture the dancing colors in this opal. The ring is 7.6mm wide at the top and is a size 6 1/2. It is available in other sizes and color combinations by special order. This handmade Australian opal inlay ring would also make a nice engagement ring or wedding ring. Due to the unique conditions under which opal is formed, it is nearly impossible to find two opals exactly the same. Opal is the only gemstone known to man to have the natural ability to diffract light. An opal?s color is created when the voids between the particles split light entering the stone. The size and alignment of the spheres and voids, as well as the light source, determines the colors produced. To view an opal?s color play at its best, the light source must be coming over your shoulder. An opal?s color can cover the full spectrum of the rainbow. The opal in this ring is genuine Australian opal, not a lab grown imitation.